Before the modern introduction of qin tablature paired with number notation and/or staff notation (see sample),1 qin melodies were written using only tablature.2 This tablature, unique to the qin, is called "qinpu".3 It is a distinctive type of shorthand tablature that does not indicate notes, but rather describes in great detail how to play melodies. A number of melodies in this shorthand tablature would then be collected into qin handbooks, also called qinpu. 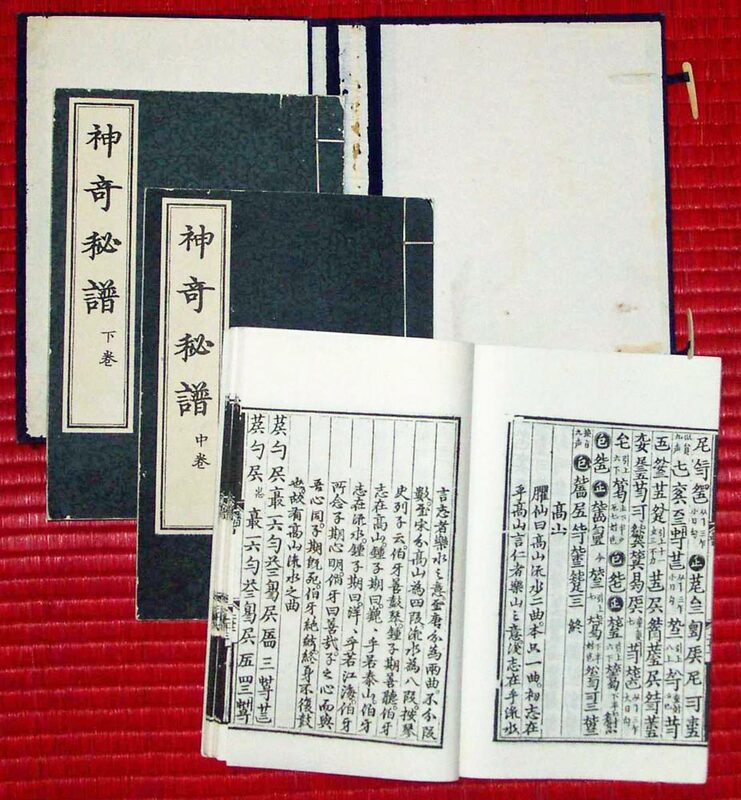 At least 150 qin handbooks from before 1950 are still readily available;4 these include about 650 melody titles.5 A few handbooks have only instructive articles, but most have qin melodies written out in tablature. On this website, commentary on individual melodies is linked either through the melody list, through the earliest handbook which includes it, or (for those with most detail) alphabetically via my repertoire. Detailed commentary is mostly limited to melodies I have personally reconstructed. Staff and number notation indicate notes, not finger positions. Notation is generally thought to indicate absolute pitch: A = 440 Hz. As discussed in a separate comment on absolute pitch, this may be true today, but in the past the actual pitch of A varied considerably. In Chinese number notation today it is often considered that "1" has the same pitch as the modern "C". By tradition, though, "1" was relative pitch, comparable to the Western "do". For standard qin tuning either the first or the third string can be considered as do" ("gong" or "1"). So the absolute pitch of 1 depends on the mode of the melody as well as the relative pitch to which the strings have been tuned. In my own transcriptions into staff notation I treat C not as an absolute pitch but as a relative pitch, i.e., do/gong. As opposed to notation, tablature describes things such as finger positions and stroke techniques. Perhaps the best known examples of tablature are the bar chord indications for a guitar. The text above describes how the word "qinpu" can refer both to the concept of written tablature for the qin and to books that collect this written tablature. When I studied the qin with Sun Yuqin and 蔡德允 Cai Deyun (ROI CDs) they both would give me the qinpu for the one piece I was studying at the time; it could come from any of a number of handbooks, it could have been copied out by one of their students, or it could have been copied out by themselves. 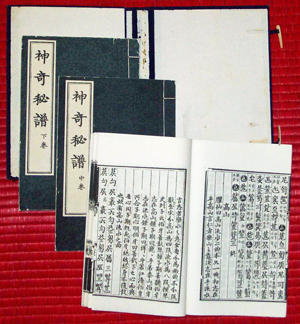 Students of Cai Deyun eventually collected the tablature for pieces she taught and published them as the Yinyinshi Qin Handbook. Many past handbooks were probably formed in this way. These are included in this list. A cutoff point of 1950 was selected because the modern accounting of old tablature dates back mainly to the research project led by Zha Fuxi in the mid-1950s. Since that time handbooks have continued to be published, both in modern form (e.g., with notation as well as tablature) and in traditional form (no notation but perhaps modern binding). It is very difficult to know how much of the past repertoire the known surviving handbooks include. The list in Qinshu Cunmu adds more book titles; and Zha's Guide, Section 4, mentions but does not index at least 35 additional handbooks, mainly because they were handcopies that, by his account, repeated tablature that could be found in other handbooks. Some of the individually hand-copied tablature certainly included unique melodies and/or unique versions of melodies. It is natural that hand-copied tablature would be lost, but according to Tang Yiming, the compiler of Tianwen'ge Qinpu (Folio 1), many printed handbooks quite likely are also lost. His comments are translated by Van Gulik in Lore, pp. 30-31. The so-called handbooks of the qin are not very much sought after by bibliophiles: they content themselves with just collecting a few items, so as to have also this sort of book represented on their shelves. As bookshops cannot sell them at a high price, they do not value them much; as moreover these books were very rarely reprinted, they were easily lost. During eighteen years I was able to collect only 41 specimens, which were bought by me or presented to me by my friends. "(G)enerally qinpu were published in very limited editions, printed from badly cut wood blocks, and on inferior paper. The reason for this state of affairs is that they were usually published by qin teachers, for the use of their pupils. So the printing and editing were done as cheaply as possible, and only a small number of copies were made. An exception is formed by those qinpu that were published by scholars of name and high official standing, who could afford to have a handbook published without regard to the cost." In addition, if the old guqin melody lists are any indication, the number of melodies lost far exceeds the number that has survived. There are also recordings of some of my own creations, such as these.